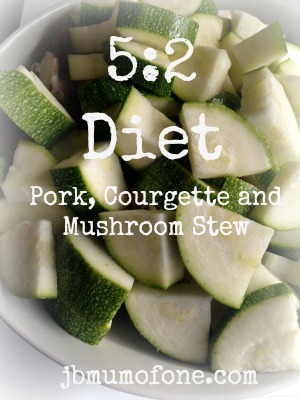 One of the things that I am really loving about the 5:2 diet is that it is making me revisit some old recipes. I am also coming to realise that low fat food can actually be super tasty. I am not sure how much weight I lost last week as am due to weigh in two days time so will keep you posted. Dry fry the pork and chopped onion for approximately five minutes until posk is coloured and onions soft. Stir in the chopped tomatoes, red wine, tomato puree, stock, herbs, mushrooms and courgettes. Bring to the boil then cover and simmer for fifteen minutes. Blend cornflour to a paste with a little water and stir in to mixture. Simmer uncovered for a couple of minutes to thicken the sauce. This recipe makes four servings and each serving has just 220 calories. It also freezes really well. Adding a 30g (dry weight) of boiled basmati rice brings the calorie total to 327 calories. Not bad for a really tasty meal. You could also bulk this out with other vegetables and a little garlic too. Sounds like something that Oliver Twist would be forced to eat. Also, I’ve realised that your blog name is something of a fib. It was really nice…honest! I am unsure what to do about the blog name too. What do you think? Leave the name as it is. what a nice combination! i wish i could see the end of the recipe.